Travel store is also a good idea. If you run a travel shop then you can sell a huge variety of products. You can start with bags and then sell packs, luggage, accessories or even casual clothing. Yet, if you want to create a successful travel online store then you need a website. It is a good idea because customers tend to search for travel items online before going to the stores. Moreover, online stores are a great choice if you want to save customers time due to easy navigation. It also limits the necessity of redundant explanations for you. And we have a website template that can build a great travel store for you. 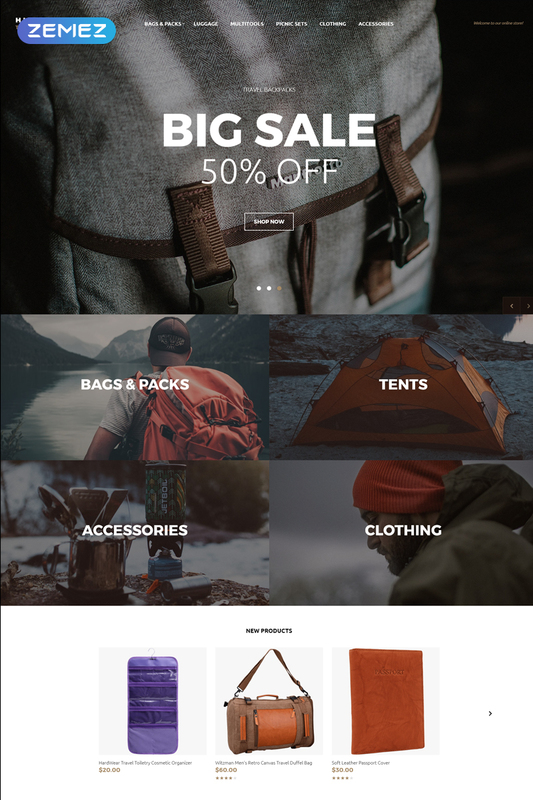 Hiker Way OpenCart theme is stylish. It is eye-catchy and fully responsive. You can change any part of your website and use included effects and elements to improve the design style. It also includes a cart, wishlist, and compare button. And if you want to tell more about your store or product you can use a blog and social options. It is so good that fit any clothing store too.